Personally I wouldn't like to say. I think it is juvenile. Hello! 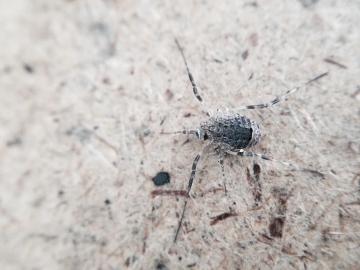 I found this harvestman in my garden (N16 7NL) in London. I would love to know the species name. Thanks! I released the spider outside after catching it so am unable to send it to you. If I find another then I will post it to you for proper identification. This looks remarkably like Zoropsis spinimana, see Zoropsis spinimana established indoors in Britain, a spider well established in the London area and also in Sussex, but Bristol is a completely new part of the country for the spider! There are other southern European Zoropsis species, so really examination of an adult is necessary to be sure, especially since the pattern doesn't look quite typical for Z. spinimana. Are you able to post me the spider for definite confirmation (if it is adult), to Peter Harvey, 32 Lodge Lane, Grays, Essex RM16 2YP ? Inside a plastic container with a couple of small air holes, inside a padded envelope would be fine. 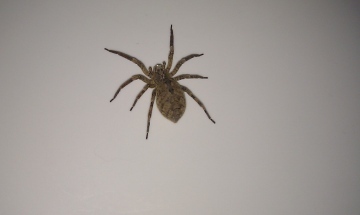 I found this spider in my house last night (BS3 3AQ). I have never seen a spider with an abdomen this large (I initially thought it was a beetle when I first saw it across the room) and wondered what it was. Sorry for lack of scale on the picture, the abdomen was approx 3cm in length. Yes, this looks like Steatoda nobilis, the so-called 'noble false widow', the spider which the media make such an unjustified fuss about. It has been frequent in the southern coastal counties of England for a great many years, without causing any problems. It is nowadays frequent in many areas of southern England and is found in south Wales summary page. The media frenzy caused by this spider is unwarranted. There are a number of other 'false widows' in Britain, some which are native or have been in the country for centuries, so there is a lot of misinformation about these spiders. Steatoda nobilis spiders are unobtrusive, have no interest in attacking humans and would only bite if they were put into a position where they do so as a defensive reaction. Honey bees and social wasps pose a far greater risk. 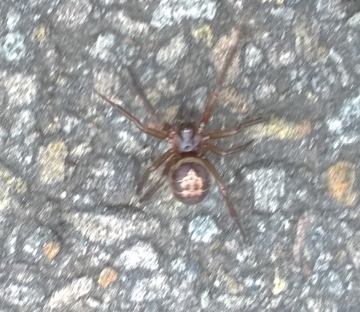 I believe this is a Steatoda nobilis found on my street SA3 5HD, in Swansea on 2nd April 2015. It was outside a neighbour's house, who had recently dismantled a shed which had been left out the front for removal, maybe it was living in there. Can someone please confirm my identification? Thanks. Alistair I was unaware I had suggested that you should post all the Linyphiids you find. I specifically requested a single one for which you posted a photograph. You should certainly work through your local Area Organiser, since that is a key part of their role and reason for being there, but you have to be prepared for them and sometimes others to actually examine your spiders where the need arises. Inevitably that is likely to sometimes involve posting them. It will be impracticable for me to post all the Linyphiids I find, as I expect this will be a daily-weekly occurrence. It's also neither practicable nor desirable for every spider to be posted on the forum one at a time with a photoset which may or may not be deemed satisfactory to convey the ID has been correctly established. I will speak to my local Area Organiser who should be able to process records/vouchers for at least 'routine' species?